Moraine Valley Community College Building L | Hutchinson Design Group, Ltd. 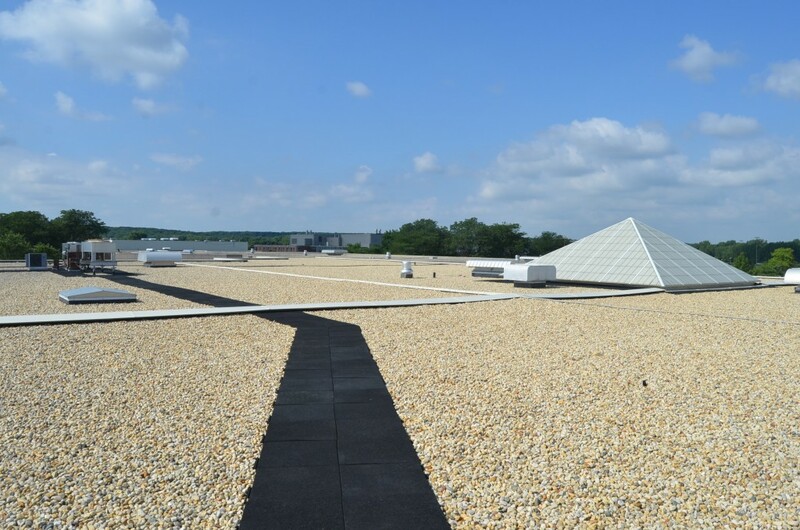 The existing ballasted PVC membrane served the college well for the first 10 years of its service life, after which the PVC polymer migration into the ballast resulted in a rigid roof membrane prone to splits, especially under foot traffic. Numerous roof leaks into the interior disrupted the educational process and created unsafe slip conditions, as well as manifesting staff concerns with mold. This project was the third in a series of three required to completely replace the existing roofs on this large multiple building educational complex (buildings S, B, and L). Prior to the projects, HDG met with the college Building and Grounds Director, ‘Green’ Consultant, and Vice President to review the concept of sustainability. The Green consultant, armed with incorrect precepts, immediately asked for a cool roof membrane: “It will save energy and reduced the urban heat island”, he proclaimed. After a review of the facts: Ballasted roof systems are a greater energy saver than cool roofing; that reflective roofs actually increase the ambient air temperature above the roof surface; and that with the exception of one reflective roof membrane commercially available in the USA market, reflective roofing has an unproven track record in the field; with formula’s being revised almost yearly they could even be considered “experimental”! 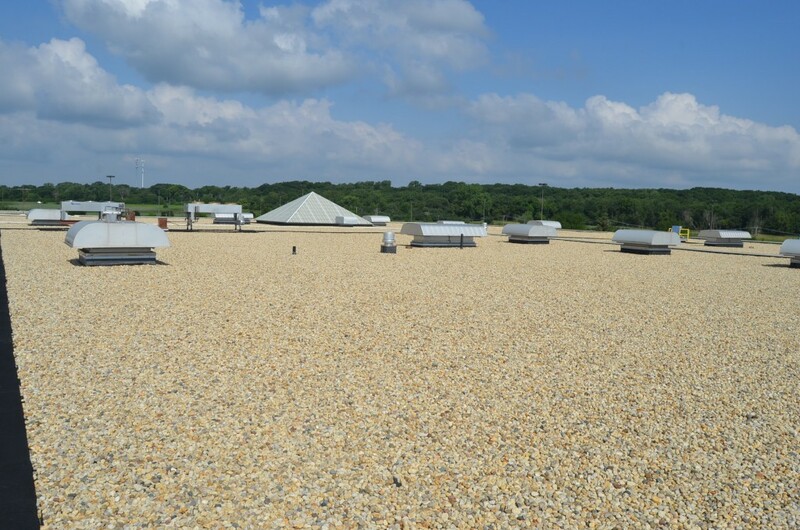 A ballasted 90-mil EPDM system with enhancements was decided upon for the colleges preferred roof system. Roof cores revealed expanded polystyrene insulation below the 45-mil PVC membrane on a 2-ply built-up roofing vapor retarder on a concrete roof deck. The existing vapor retarder was found to be in good condition, and very well adhered to the concrete. Removal of the vapor retarder would be costly and without merit, so it was decided to be allowed to remain. While ballasted roof systems have been around for decades, and this author has observed numerous systems over 25 years of age and still performing; therefore, the goal for this roof system was 50 years of service life. 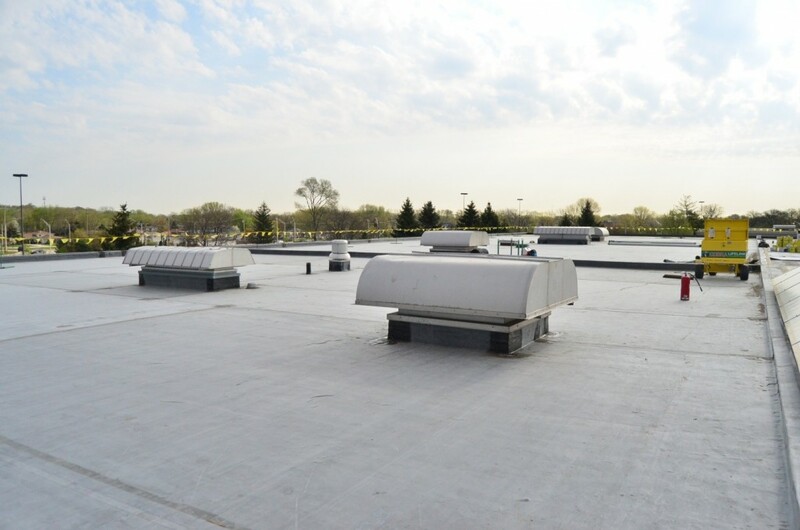 As this project involved the removal of the existing roofing, roof edge raising, roof drain removal and replacement, as well as HVAC equipment remediation, it was decided to enhance the existing vapor retarder with fully adhered 45-mil EPDM (see photo 1), so that the entire existing roof could be removed, the ancillary details performed, and the new roof system installed in a monolithic manner. Additionally, 25 PSI polyisocyanurate insulation, which is more stable, was selected. A 90-mil EPDM membrane with 6” seam tape, and with all lap seams covered with self-adhering seam tape was designed. Looking forward 25 – 30 years when the ballast might start to shatter and create sharp edges, a protective filter fabric was installed over the EPDM as a buffer between the EPDM and ballast (roof section can be seen in Fig. 1). As the thickness of 90-mil EPDM, even with its flexibility, is difficult to install tight into the angle changes from horizontal to vertical, and heavy to extend up and over roof edges, this condition was designed and detailed with anchoring the field sheet to the wall, and using a 60-mil base flashing sheet with 6” seam tape and cover strip. To raise the roof edge a pre-fabricated metal roof curb, in lieu of wood blocking, was designed (see Fig. 3). The construction commenced in mid-March 2013 and was completed in late June 2013. The author observed the construction and several anomalies were observed. The existing roof edge wood blocking was found to be in good condition and was allowed to remain. Even with a high caliber contractor, their project organization and crew management was less than desirable and lengthened the construction time. Undulating concrete roof decks challenged the tapered insulation, and the required detailing on what many would consider the simplest of roof systems took considerable time to install. Hutchinson Design Group, Ltd. © 2019. All Rights Reserved.